Welcome everyone!! I hope you’re having a good day. 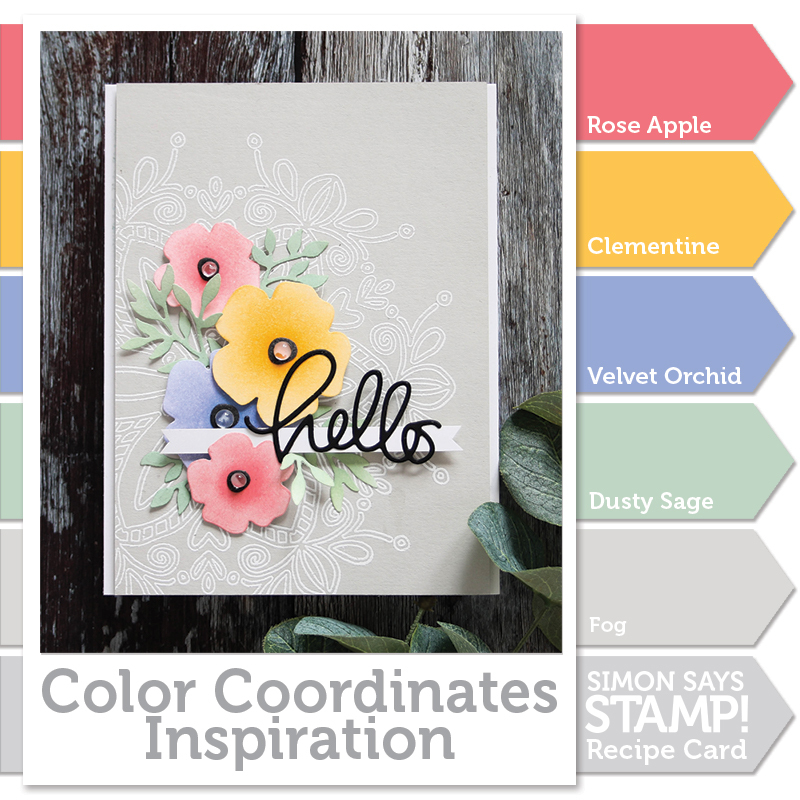 I have a Color Coordinates recipe that is perfect for Spring flowers! I’ve used some of our new ink colors; Rose Apple, Clementine, Velvet Orchid and Dusty Sage. For the neutral, I’ve used Fog cardstock. I started by die cutting the Forget Me Not Flowers from Neenah white cardstock and colored them in using Tsukineko sponge daubers with the inks. I concentrated the ink in the center of the flowers and blended it out to the edges. Blending is a great way to extend your ink colors by creating lighter shades. Once I had my flowers and leaves colored, I arranged them onto a white embossed Flower Medallion stamped on a Fog cardstock panel. 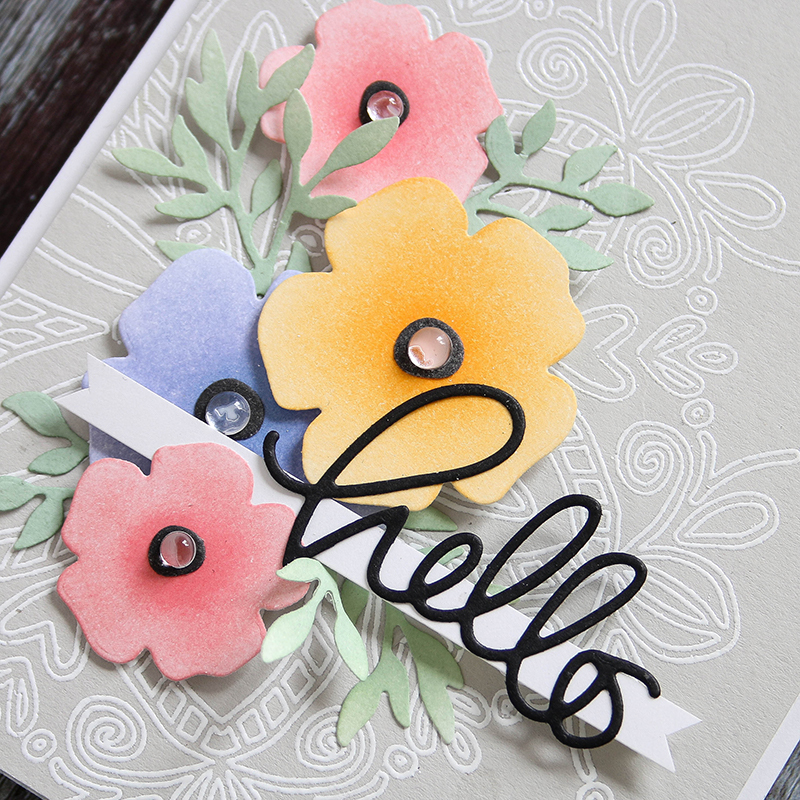 I die cut Hello from black cardstock and set it onto a strip of white. To finish up, I added Studio Katia round drops to the flower centers. I’ve filmed the process of making this card which you can view below or on our YouTube channel HERE. Blog Candy Alert!! Follow our blog via email and comment on this post for a chance to win grab bags and blog candy! 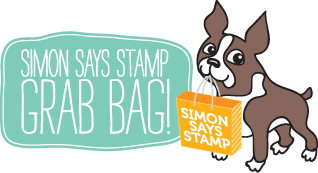 Remember to tag your projects with #simonsaysstamp on social media so we can see what you are creating! Beautiful! Lovely color combo, and your blending is perfect! Such a beautiful card! Got to get this die set. 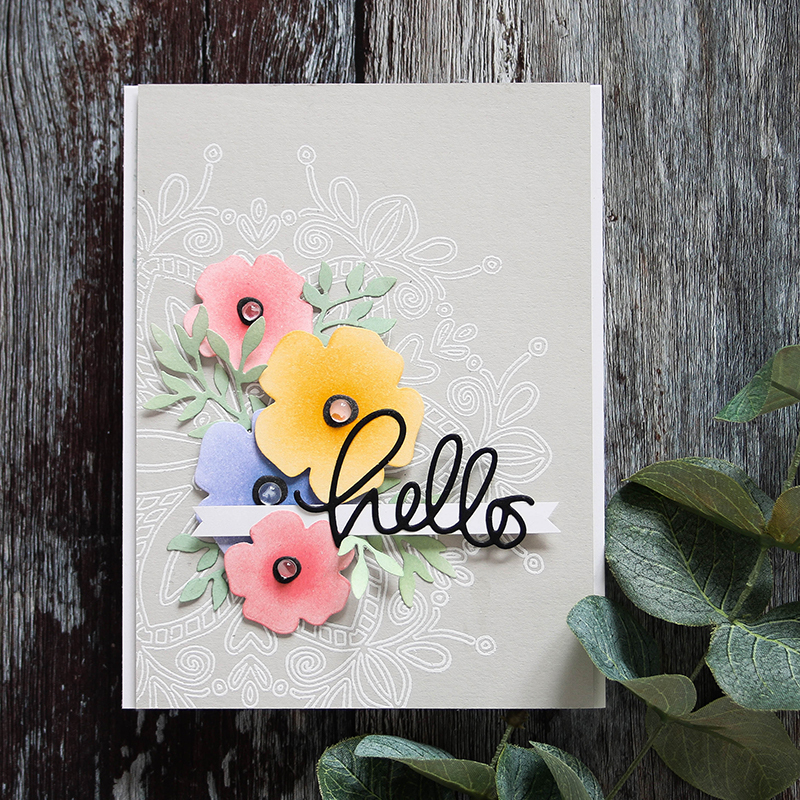 Pretty card, Shari! Those new inks are on my wishlist, nice to see them on projects. Beautiful colors! I love the soft colors on the grey cardstock. Beautiful! Love the color combo! Beautiful! Thanks for the giveaways and inspiration! I love the softness of the inking and that medallion in the background! Another beautiful card and some wonderful techniques! Thank you so much for sharing! Hurray for Spring – and some beautiful colors!! !Seems like it’a been a LONG time in coming.